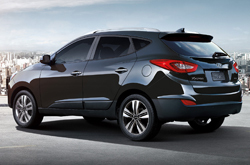 The Hyundai Tucson is an excellent crossover choice for shoppers wanting both luxury and utility out of their SUV. Keep reading our 2015 Hyundai Tucson review for all the details on this terrific crossover. Available in three trim levels: GLS, SE and Limited, the 2015 Hyundai Tucson offers Carrollton drivers a bevy of features and options that crossover shoppers will love. Starting with the base GLS trim, shoppers will find several terrific features on the 2015 Tucson, including 17-inch alloy wheels, front solar glass, rear privacy glass, air conditioning, a tilt-and-telescoping steering wheel, power windows, a 6-way adjustable driver seat, a Bluetooth phone system and audio controls on the steering wheel. The next level SE trim adds automatic headlights, heated side mirrors, front foglights, roof rack side rails, rearview camera, an 8-way power driver seat with lumbar support, a 4.3-inch color touchscreen, heated front seats and leatherette seat bolsters. Upgrade to the top tier Limited trim and you'll get 18-inch alloy wheels, a chrome accent grille, LED taillights, leather upholstery, keyless ignition/entry, premium door sill plates, a leather-wrapped steering wheel and a retractable rear cargo-area cover. We recommend choosing the Limited trim, not only for its amazing features, but also for its fantastic power. The Tucson Limited is powered by a 2.4-liter DOHC four-cylinder engine that rates a 182 horsepower, which gives the crossover a comfortable and refined driving feel when paired with its six-speed automatic transmission. Our 2015 Hyundai Tucson review also found the standard safety features on the Limited trim to be very robust. They include electronic stability control, six standard airbags, active head restraints, traction control, downhill brake control and hillstart assist control. 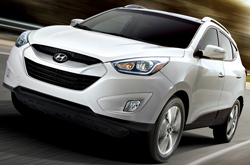 The 2015 Hyundai Tucson is now available in Carrollton, so stop by today and test drive this amazing crossover. Families across Texas have already chosen the Hyundai Tucson as their next family car, and we know you'll love it too once you get behind the wheel. If you've ever thought about purchasing vehicles like the 2015 Nissan Rogue, Chevrolet Equinox, Toyota RAV4 and the Honda CR-V in Dallas, compare Hyundai's new 2015 Tucson first; we're sure that it's ideally suited for you. The Tucson's progressive onboard technologies and low MSRP are just a few of the noteworthy qualities that shoppers will appreciate. It's a fantastic value, which you'll certainly see when comparing its price to the competition. For more details about its vehicle specs, check out the Tucson's quick-facts list below this text. 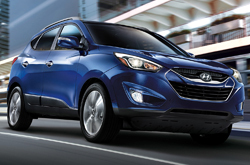 Thank you for selecting Van Hyundai as your source for 2015 Hyundai Tucson reviews. Stop worrying about your next purchase; look to the top-rated Tucson franchise in Dallas for well-researched reviews written by automotive enthusiasts. Everything perspective car buyers need to make sensible decisions is right here, including info regarding cabin amenities and other specs. Each overview is filled with worthwhile data and specs - all at your fingertips. Please visit our Hyundai review and compare gallery if you feel the Tucson is not the right choice for you; there you&ll learn about Van Hyundai's entire lineup.